I am currently working on a long Walnut dresser that was made around 1960. 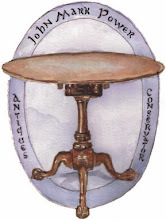 The dresser has a label on the back, but no mention on it of who manufactured the piece. 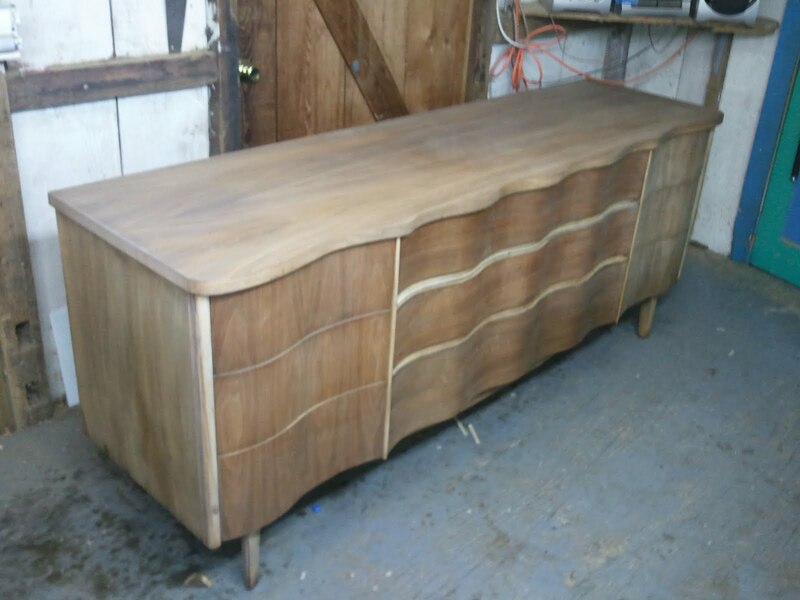 I can say by looking it over that it was made in America because of the use of Walnut veneers and Poplar as a secondary wood. 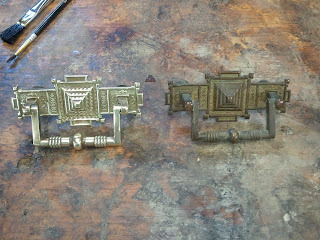 The piece has aluminum pulls and feet appliques which were painted to look like brass. 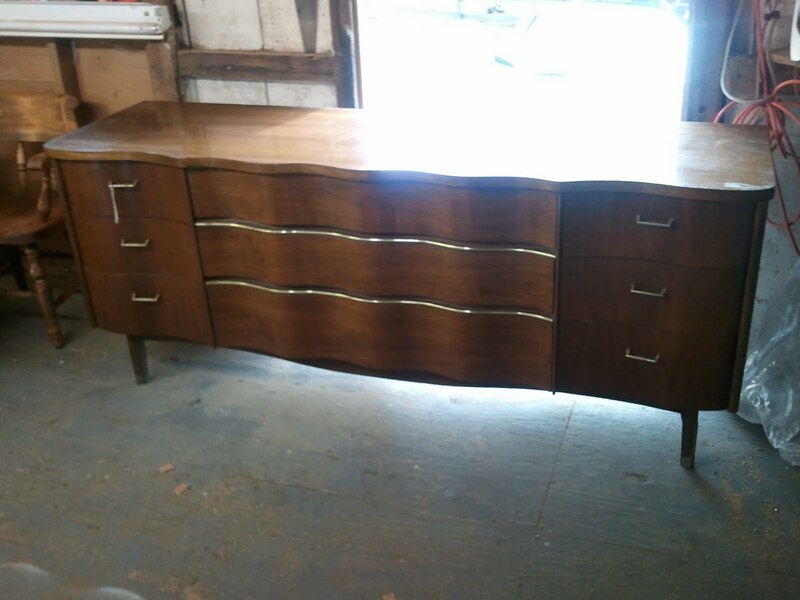 the strips between the drawers are made of plastic. There are also indications that the dresser once had a mirror, Although I think it looks quite nice without it. 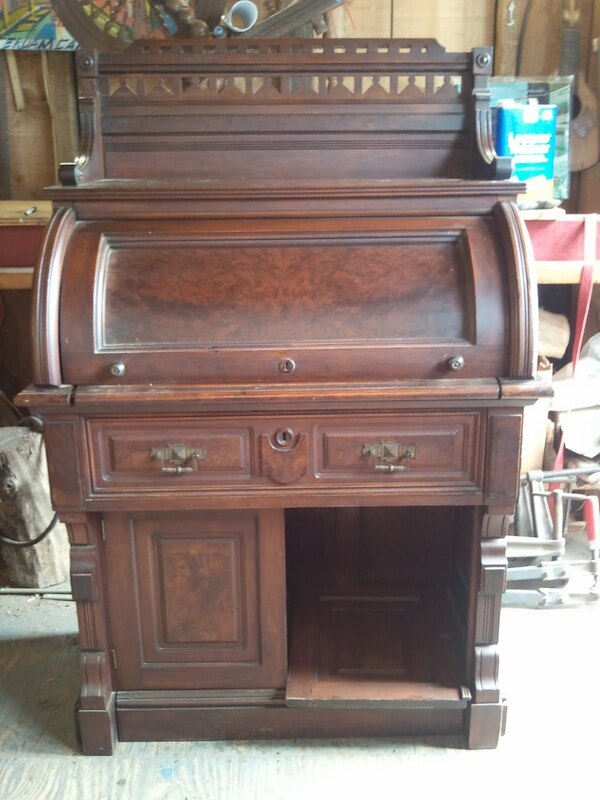 Overall, the piece is in good condition. The finish has deteriorated quite a bit and has some significant scratching on the top. 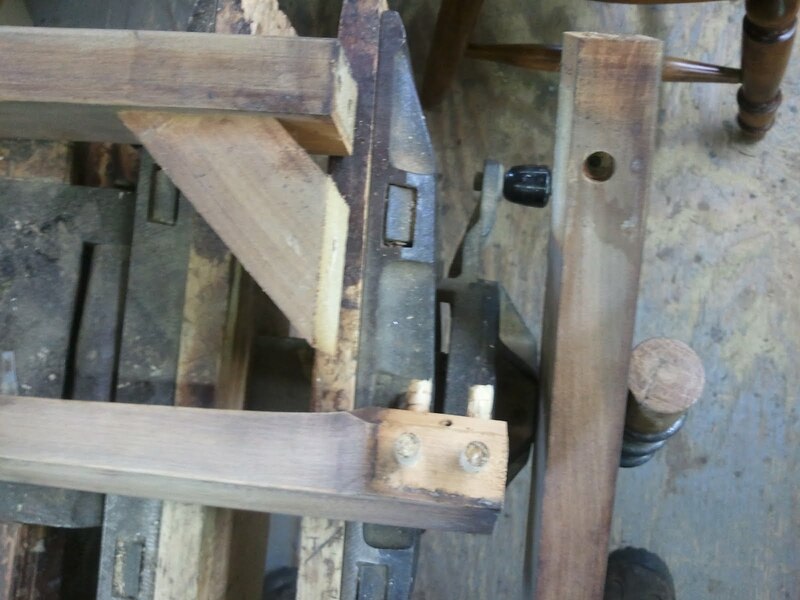 Also, the joinery on the legs has loosened up considerably. The customer also requested a darker color for the piece and a transition from the brass hardware to a silver color. 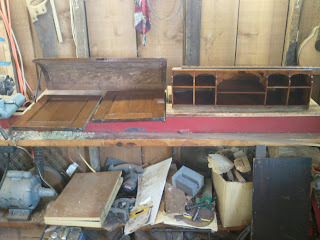 the handles and feet will be brought back to a polished aluminum and the plastic trim pieces will be replaced with ones that are silver colored. Below is a photo of the dresser as it came to me. The next two photos show some of the scratches on the top. 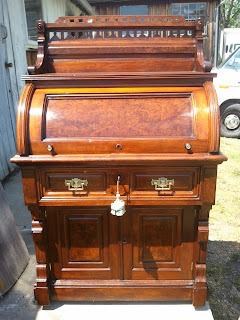 This photo shows the dresser after the removal of the old finish. 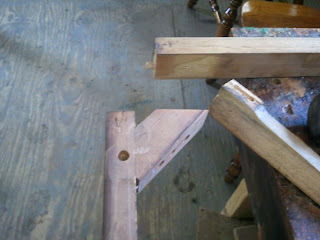 As mentioned above, the joinery was quite loose. 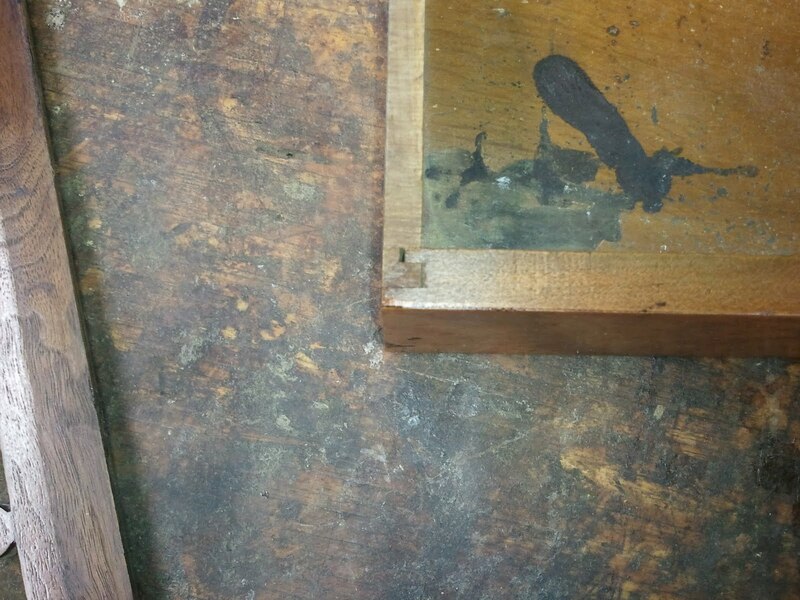 I removed the leg assembly from the case and knocked it apart to scrape the old glue. 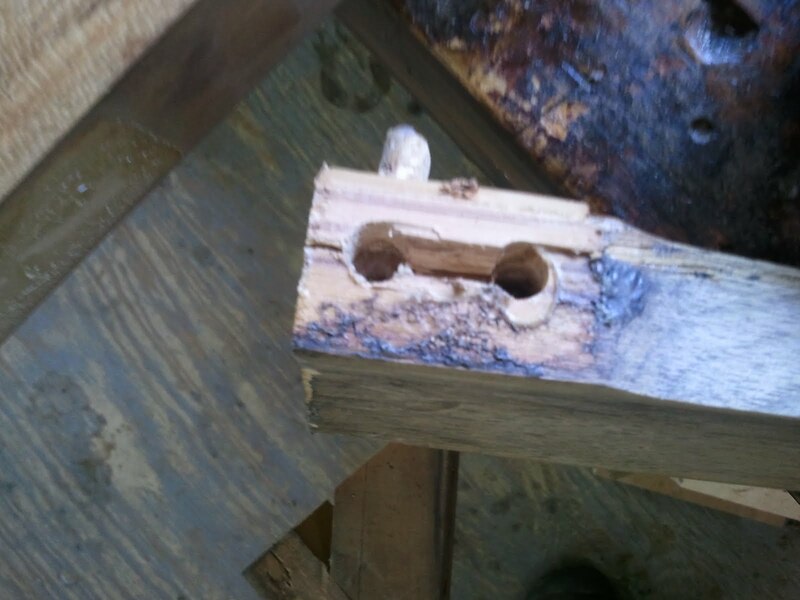 I found that one of the legs had a previous repair that was poorly done. I removed the previous repair to the leg and fitted it with new dowels where the old ones had been removed. I then glued the leg assembly and re-attached it to the case. 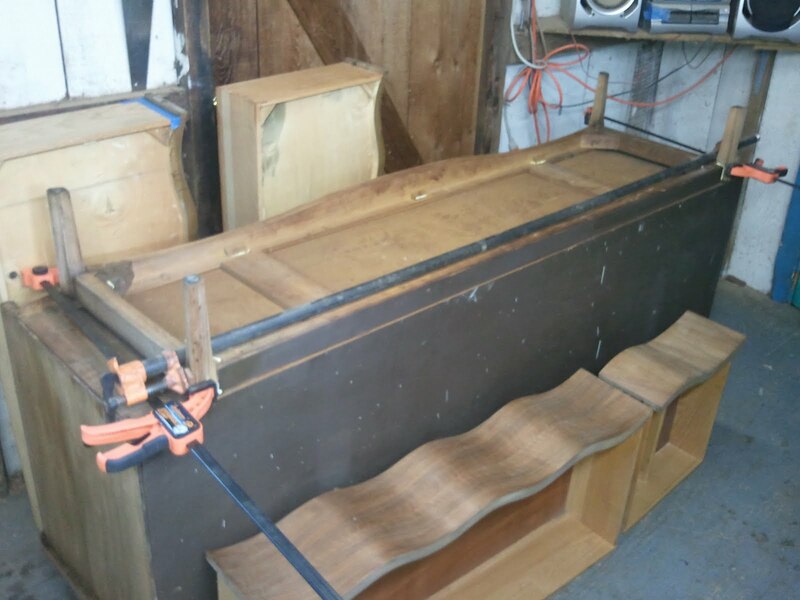 Below are a few photos of this process. 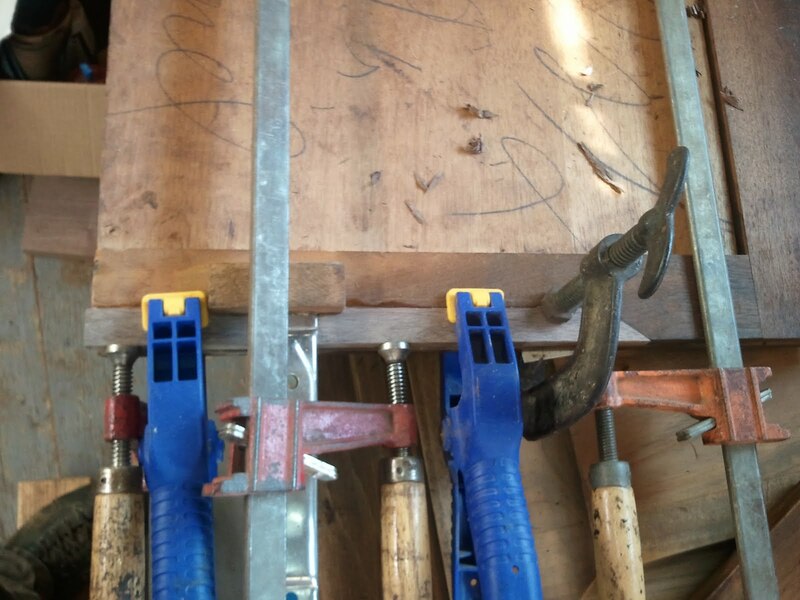 A photo of some loose joinery. A photo of some broken joinery. 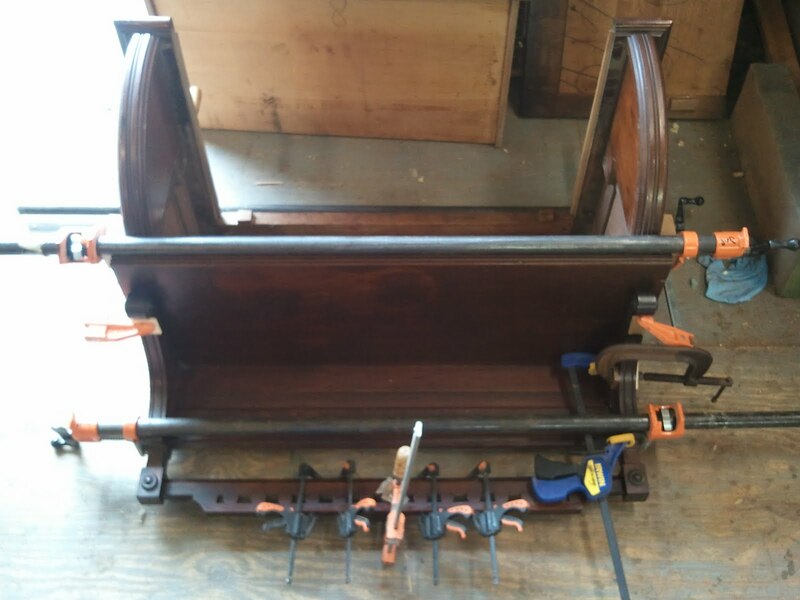 After the screw and nails were replaced with proper dowels, the whole assembly was re-attached to the case. 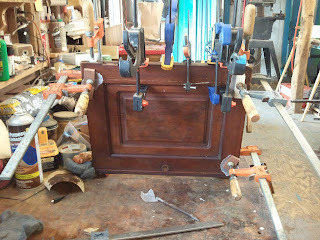 The next post will deal with the application of the new finish. 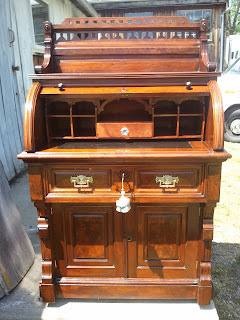 Here is a photo of the desk after the finish had been cleaned and new finish had been amalgamated with the old. 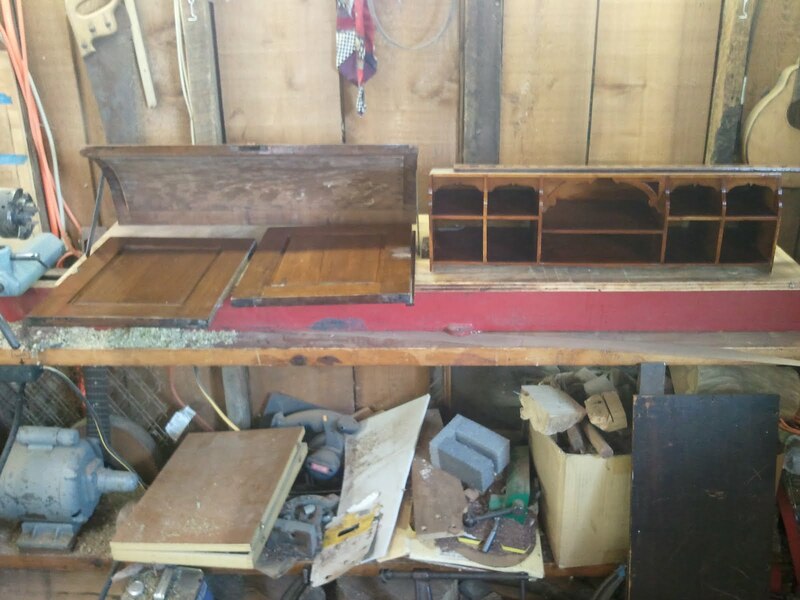 The back, cubbies, and desk lid had been removed initially for repairs and they were left out to make the finishing process easier. Here is a photo of the cubbies, desk lid, and lower doors during the finishing process. One thing I often do when restoring a piece is to replace missing or broken hardware. 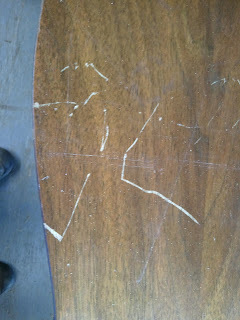 In this case, the casters that were on the desk were broken and needed to be replaced. 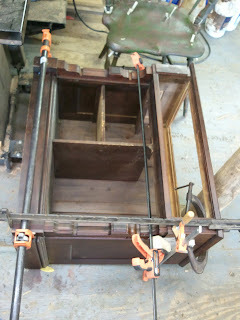 Below is a photograph of the new casters in place followed by a close up showing the a caster. 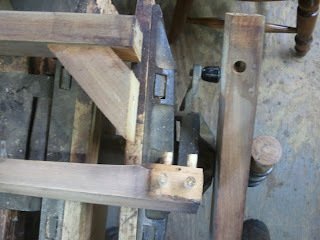 I usually go with casters that have an oxidized finish because they look more appropriate. This photo shows the two original handles for the long drawer. 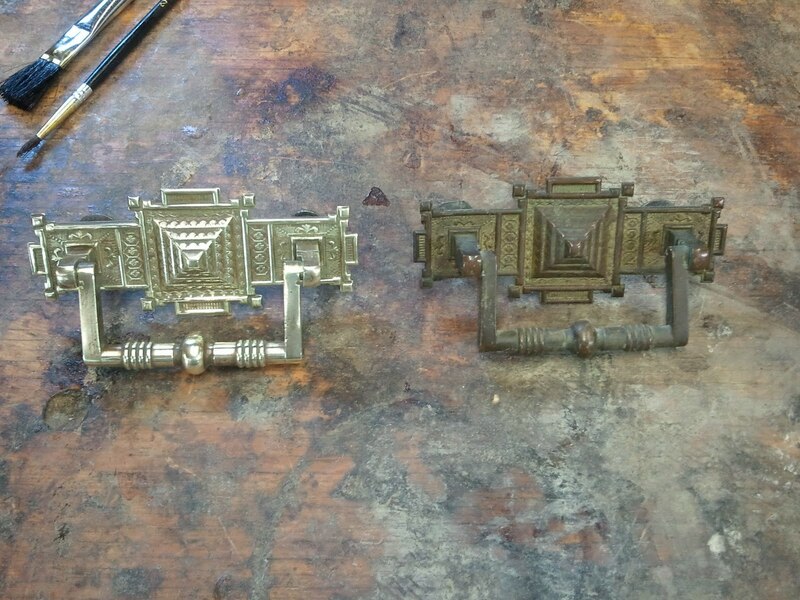 The one on the left has been cleaned. 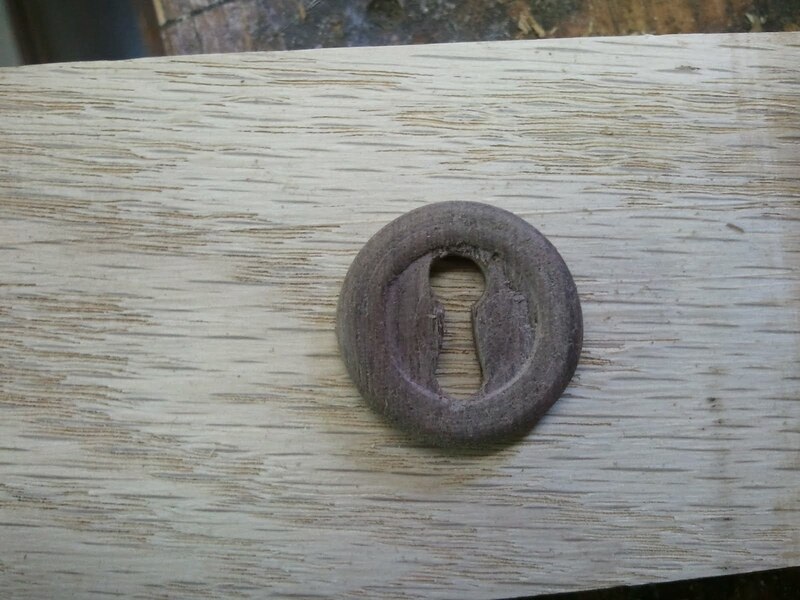 To do this I use nothing but a little elbow grease and #000 steel wool. 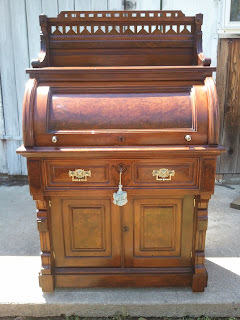 Here are several photos of the desk completed with the lid closed and then open. 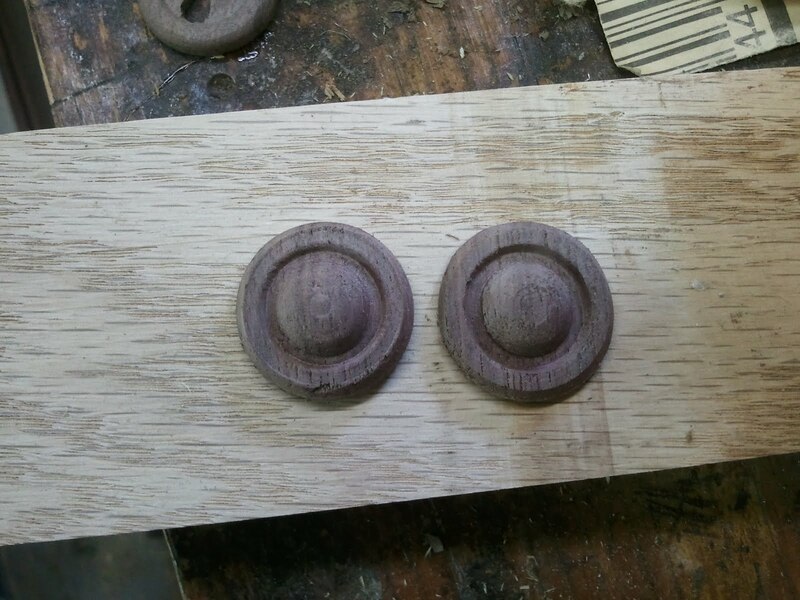 The glass knob on the inside drawer was probably a replacement but has been with the piece for long enough that I decided to leave it. 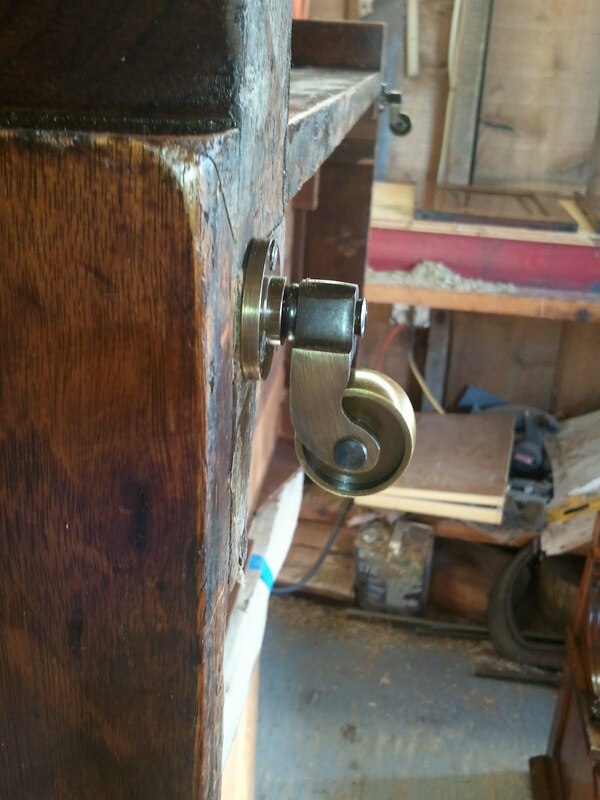 The desk I worked on previously had this type of joinery, which was used as early as 1870. With this information, I was able to identify this current desk as being made around 1890 because of its use of machine made dovetails. 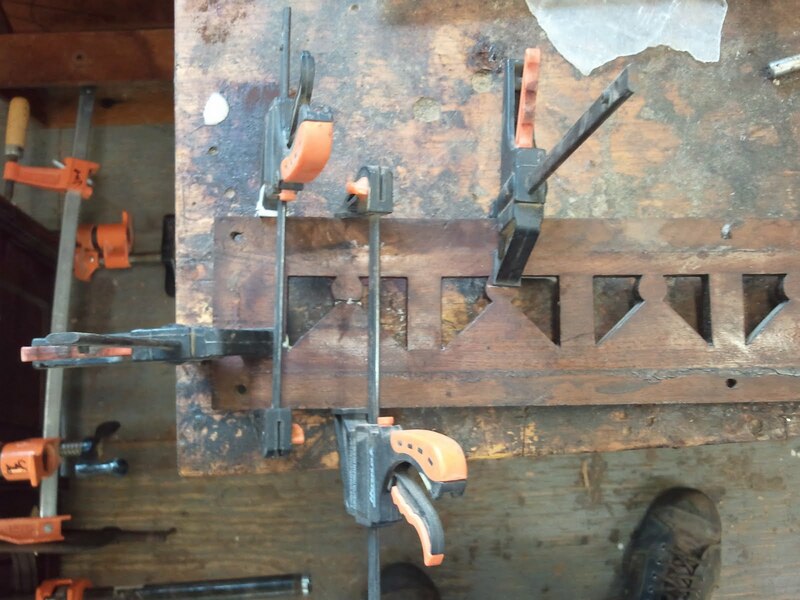 In fact, this was one of the very first machined dovetails made. What is impressive to me is how well these dovetails look and also how strong the joinery is. 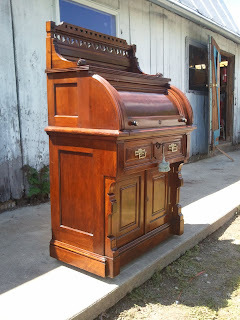 One other note, if you are interested in looking at other examples of Eastlake style and a little history on the Eastlake Movement in Furniture, feel free to click on the Eastlake label on the right hand side of the screen. 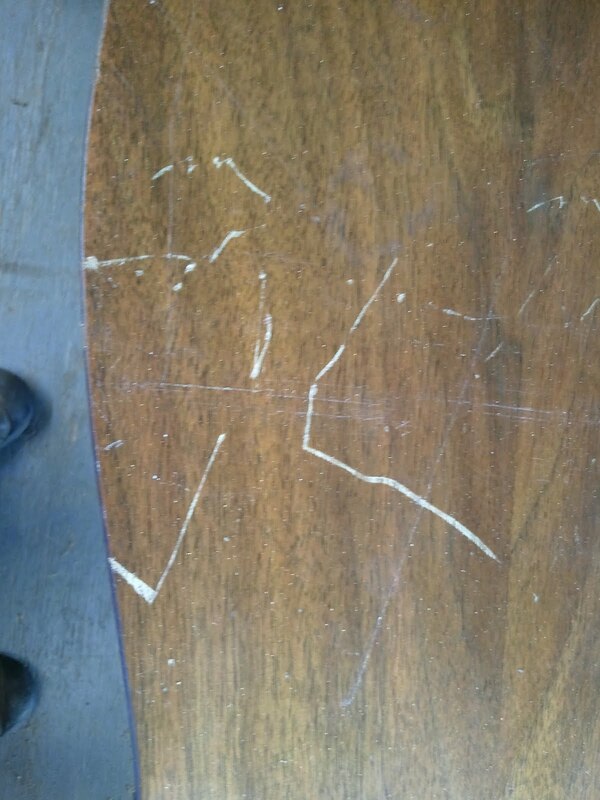 Overall this desk was in decent shape, but it had several repairs that were necessary and also a very dirty finish. 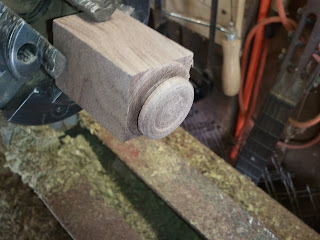 The finish beneath the dirt was in pretty good shape so I decided to restore the finish instead of removing it. 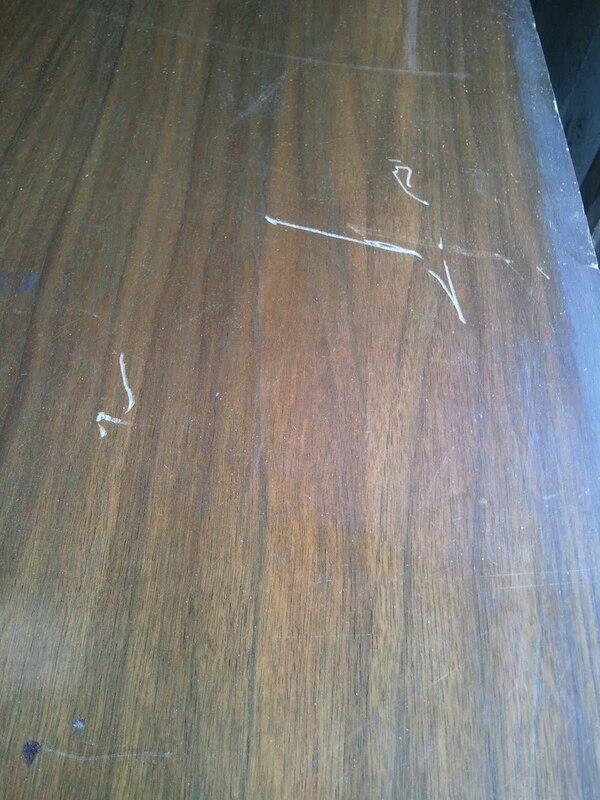 Below is a photo of the desk as it came to me. The door on the right hand side is off of it's hinges. 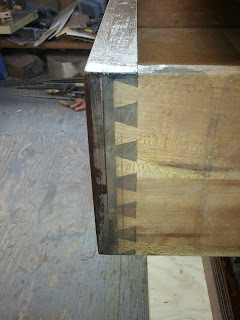 The next two photos show the joinery used in the two drawers. The large drawer in the bottom section of the case uses the machine made dovetail and can be seen below. The smaller drawer in the cubby section of the desk uses the sliding keyhole or French dovetail. This is a simple joint made using a table saw and is a good one for a small drawer such as this. 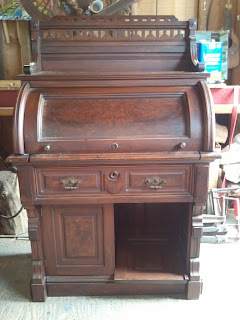 The case was loose in several places. 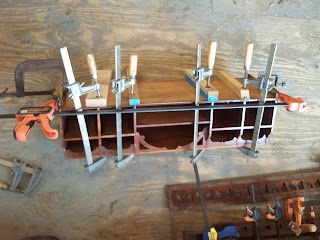 The next two photos below show the top desk section being glued. 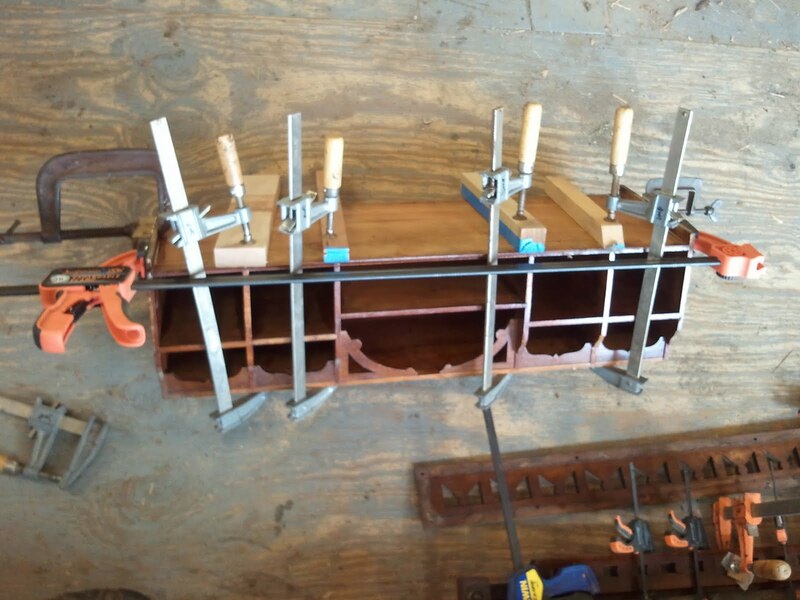 This piece sits on top of the lower section and is held in place by dowels. 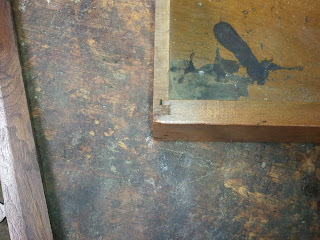 On the gallery section of the desk section, the board that creates the back section had cracked open. the next photo shows the crack being glued up. 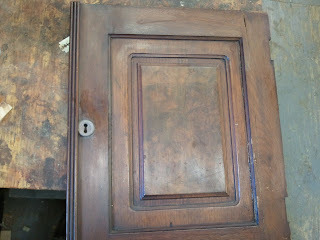 One of the doors had a crack in one of it's stiles which was loose.The next two photos show the door being glued. The cubby section of the desk was also loose. This photo shows it being glued. 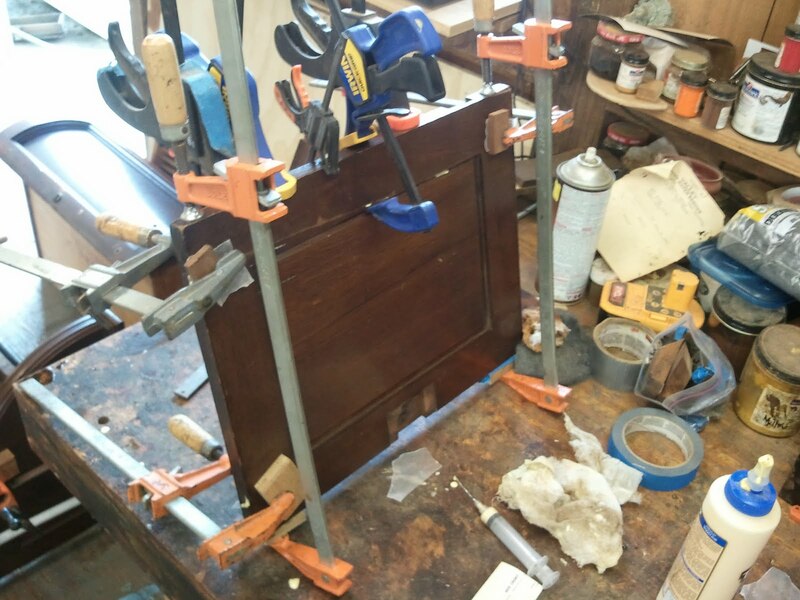 The writing surface for the desk pulls out along a rabbited track. the rabbited groove in the lid had broken on one side sometime ago. 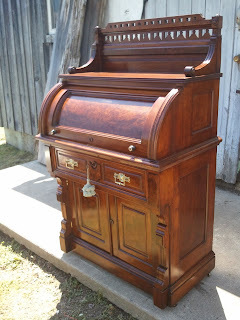 This prevented the writing surface from pulling in and out easily. 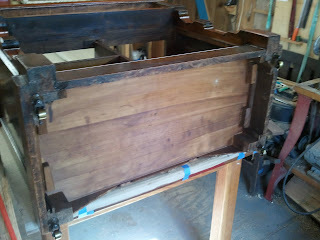 The photo below shows the broken portion on the underside of the surface being repaired with new wood. 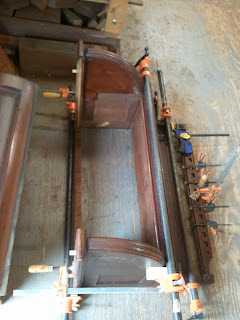 This next photo shows the lower case being glued. 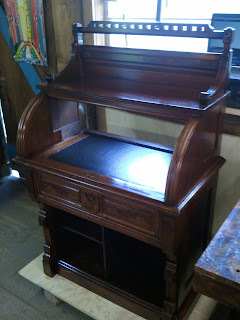 The desk surface was missing some appliques o the top of the desk, so I needed to turn two new ones. Luckily, I had several that were intact to go by. 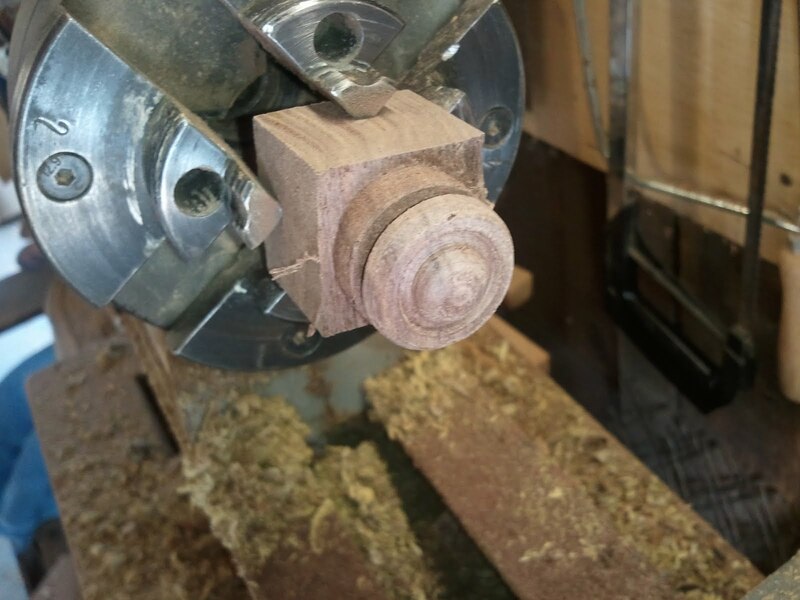 Below are two photos showing this process on the lathe and the finished product. 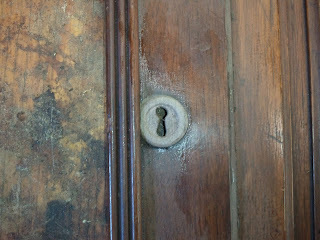 Likewise, one of the doors was missing it's escutcheon. 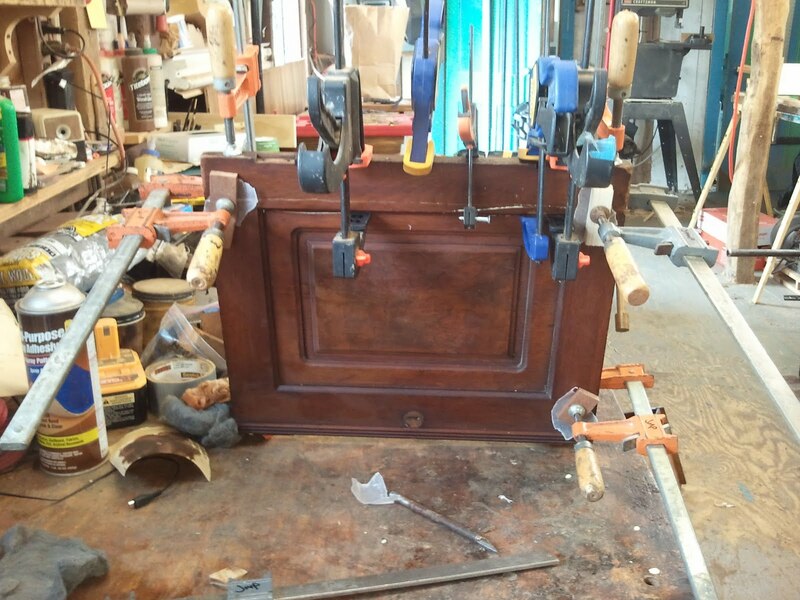 I used the existing escutcheon on the desk lid as a template and made a replica. Below is a photo of the new escutcheon being turned, and then the finished escutcheon after the key hole was filed. 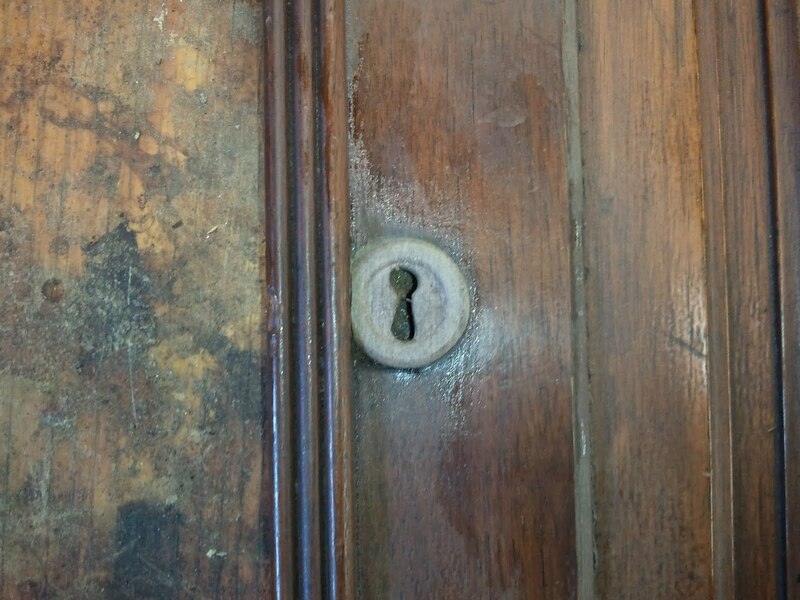 The last two photos show the new escutcheon in place on the door. My next post will show the finished piece. 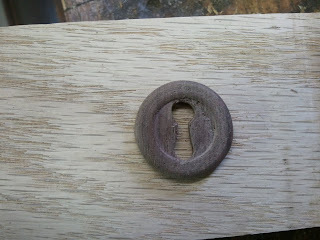 The escutcheon after the key hole was filed.